This is the old saying. 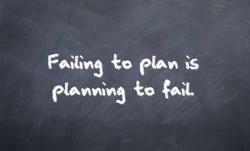 Failing to plan is planning to fail. Well, the author of that quote didn’t know much about people like me. I did plan. And I did plan to fail. Whether it was a fitness program, or weight loss, or quitting smoking, I had to fail. No matter how much planning or hoping or dreaming went on in advance, the end was always the same: failure. If I had succeeded, at any point, my life would have changed. I would have changed. The “ME” that I had spent years cultivating would be a different me. The me I knew was a smoker. The me I knew was an over-eater. The me I knew never kept is promises to himself, or anyone else. I had to fail to stay ME. If you’re already struggling with your decision – or hope or dream – to make positive changes in your life, through being more active, or making better choices about food, or being a bit more responsible with what you put in your body, don’t worry. It’s normal to struggle. It’s perfectly normal to have a battle raging inside of you. The YOU that you are and the YOU that you want to be are in conflict. But you do have a choice. You do. You are who you are in large part because that’s who you’ve been. And, it’s worked. You’ve gotten along in your life just fine – or at least I did – being who I’d always been. I wasn’t miserable. I wasn’t feeling as though I was a failure. I was, as far as I could tell, just fine the way I was. Why would I change? So, for me to be who I was and had always been I had to fail. I had to fail to become something other than what I already was EVEN if that wasn’t who I wanted to be. It isn’t easy to change your life. It isn’t easy to lose weight, or get more active, or quit smoking. 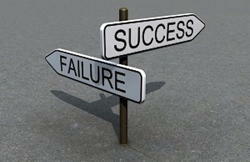 Don’t be fooled by the messages that you get from the very industry that needs you to fail in order for them to survive. It’s hard. It’s very, VERY hard. And that’s why it’s worth it. John Bingham has been an inspiring force to me during my marathon and half marathon training. Slow or fast, it doesn’t matter. Just get out there and start.